I would like to apologize for my hiatus. The reason is due to my illness, I have been sick for some time. I definitely need to catch up on updating the site, all snakes are not listed. Thank you for your time and understanding. The main purpose of this site is for information on Ball Python care and maintenance husbandry not sales per-say. One of the main problems with the reptile industry today is many are only concerned about profits, not educating new snake owners. We want you to enjoy your visit to our website and more importantly, have fun!!!!!!!!!!!!!!!!!!!! The Sienna Ball Python; we first produced this color morph in 2005. Please view our collection page for pictures. 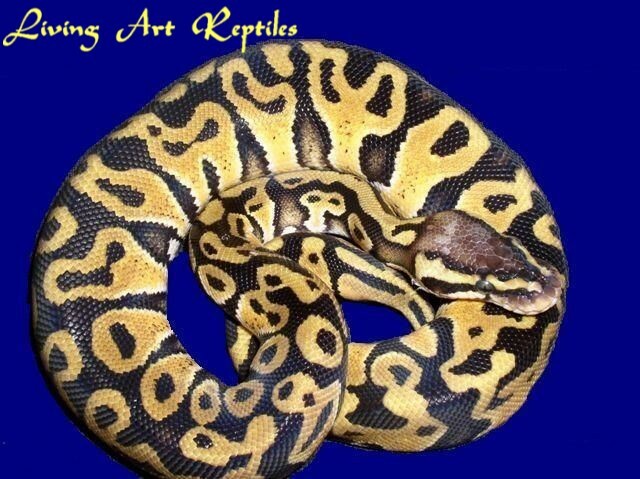 The Sierra Ball Python; we first produced this color morph in 2005. Please view our collection page pictures. The Sierra Yellow Belly was produced in 2012. The Sienna Yellow Belly was produced in 2012. Note: At this moment there is nothing available. We will be taking the next couple of seasons off to put the snakes through a rest and rotation cycle. Thank you for your time. Ball Pythons Morphs picture gallery. This page is also an Homage to the Various breeders that have put in the work to prove out the various Ball Python Morphs. They are the reason for many of us why keeping Ball pythons is so exciting. This concept and page was started in 2002. Kids Corner has links to websites that are kid-friendly, parent friendly, and worth visiting. Discovery Channel, Disney Channel, Animal Planet, Nick.com and Kids WB.com to name a few. Reptile Genetics; this section defines the genetics terminology used by Reptile Breeders. Rodent links, this section covers the breeding, care and maintenance of mice and rats. This is a little fun section where you can see pictures of various Reptile breeders.